Bruces just love to skate on the rink at the top of Terror Mountain. In Terror Mountain Tilt, you have to ensure that the Bruces don't fall from the platform and that they go through the right loop. This entrepreneur surely had a brilliant idea when he created the tilting platform; Terror Mountain Tilt quickly became Bruces' favorite game to play all day! 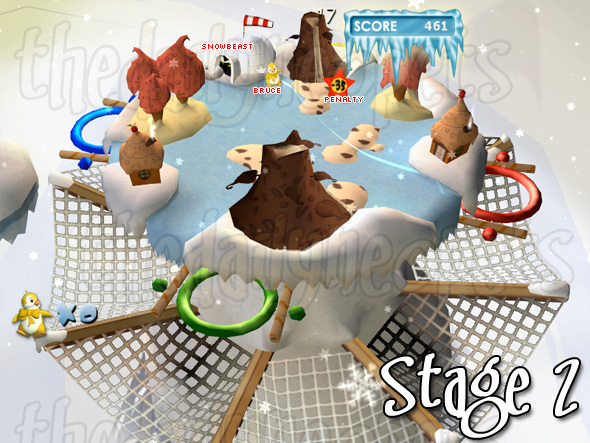 Beware, this game requires the the 3D Life Player plug-in that you can download here . 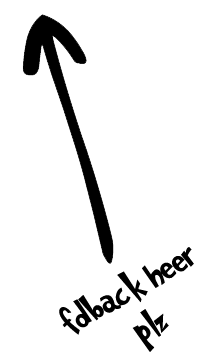 Use your mouse to tilt the platform in the direction of your choice. The objective of the game is to make sure Bruces slide into the hoop of the correct color. A blue Bruce should go through a blue hoop and so on. You'll start the game with 5 lives. Every time a Bruce falls over the platform or if he slide into the incorrect loop, you'll lose a life. If you need to pause the game, hit the space bar. Scoring depends on how quickly you can get the Bruces through each loop. You will notice that the original 25 points you can get from a loop start to decrease if you take too much time. If you take too long, you'll only earn a tiny 5 points for placing your Bruce correctly. Your score could be increased by 30, 50, 75 or 100 bonus points with those stars. Stay away from dizziness. Everything starts to spin if you collect it. Your score could be decreased by 15 or 35 points if you catch one of those penalty stars. Does it sound easy to you so far? Well, to add in a bit of difficulty, the platform has some surprises! One of them is that hoop can rotate. Before that happens, you will hear a mechanical clicking sound. The other one is that color of hoop can change without rotating. Before that happens, you'll hear 3 bips and you'll start to see color blinking on all hoops. 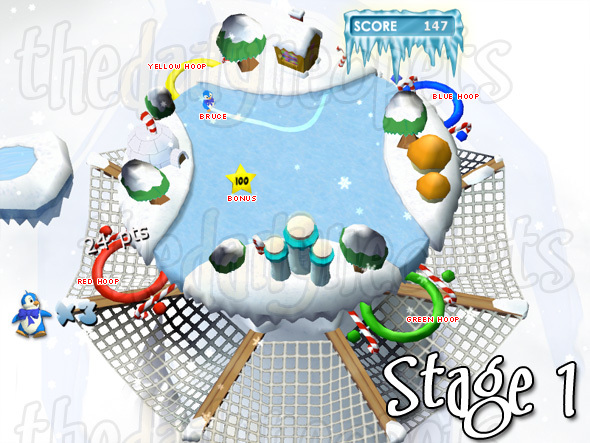 On stage 2, there is also a nasty Snowbeast that will try to bump you from the platform. The first stage isn't too hard to complete. There are only four exits, corresponding to the four hoops. The tilt stays still until you reach level 3. Then, it starts to rotate and hoops start to blink as explained previously. Pay attention to bonuses and to any extra life that could show during this stage as it's going to help you to get a higher score and to progress further in the game. The second stage offers a few new elements. The mountain tilt isn't as safe as it was in stage one. It now has 6 exits, and two will never be covered. Watch out and avoid getting too close to them. Now, there is also a Snowbeast who will try to make you fall from the tilt. On the above screen shot, the Bruce is standing in a pretty stable spot of the platform. 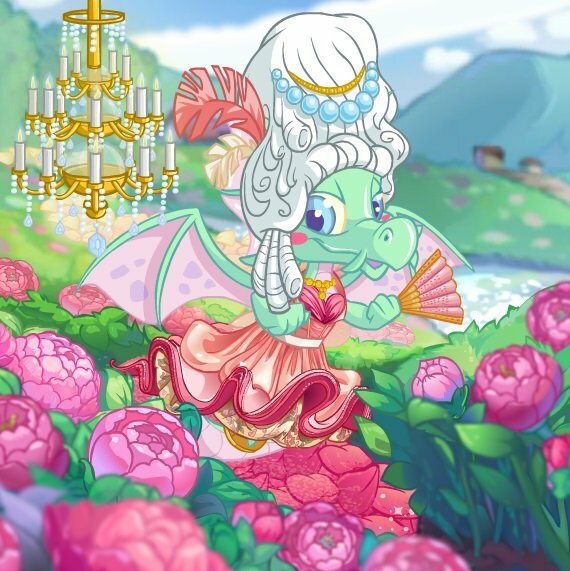 If you don't know where to move or if you need to rest until hoops stop moving, I suggest you to stand right there, between the volcano and the igloo. When you reach the very end of the second stage, a color spiral surrounds your Bruce. These spirals have an effect on the Bruce color. If you wait too long to go through any hoop, your green Bruce could become yellow! This can be really frustrating if you are short on lives or make a last second mistake because your Bruce changed color. The third stage is similar to the second one. 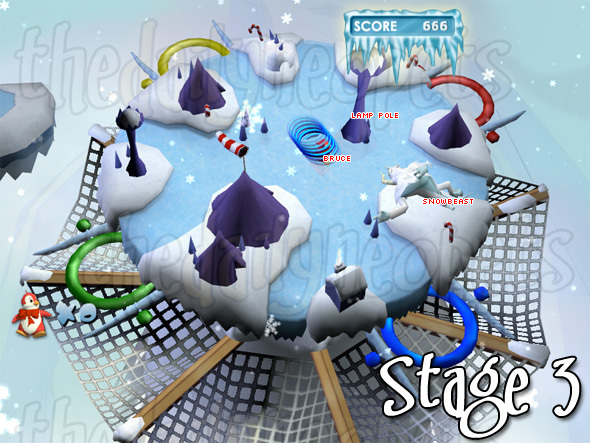 It now has 8 exits (4 of them are never covered), the Snowbeast is still trying to make you fall from the tilt and your Bruces still change color. There is also a lamp post that is going to block your vision of one of the hoops most of the time. This obstacle gets in the way most of the time and makes you bounce in all directions. Potentially frustrating! Stay in control of your tilt. If you move your mouse too quickly, and in the wrong direction, your Bruces are likely to fall from the platform or to go through the wrong loop. Sound alerts are really helpful in this game. Turn the music off, but be sure to leave the sound effects on and not to play other music on your computer at the same time. Focus on the game. Bonuses and penalties, loops changing color, rotating loops... all this make it harder to score points. If you focus on the game, you are likely to learn the pattern for all this. Try to anticipate what is going to happen. If you are not sure what you should do, stay as still as possible and wait for the loops to stabilize. You may get less points that way, but at least you won't lose a life and continue playing the game longer. Count how many Bruces you have successfully guided through loop. It takes 10 Bruces to complete stage 1, 20 to complete stage 2 and 30 to complete stage 3. Terror Mountain Tilt is one original and fresh game! Graphics are beautiful because of the 3D life plug-in. Give it a try and it is probably going to become one of your favorite games. Bruces' charm is impossible to resist!